Not a fan of corned beef? 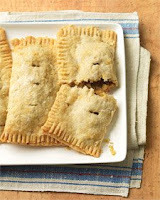 Then plan on making this recipe from Everyday Food for St. Patrick's Day. The best part is that the recipe includes instructions on how to freeze the pies, so you can make them on the weekend when you have more time. Substitute A-1 for the Worcestershire sauce to make it MSPI-friendly. When I made these, I didn't have any cabbage on hand, so I used a couple of grated carrots and some diced onion. Turned out great! Do you get American Baby magazine? They had an article today about tummy issues. The author, a pediatrician, sounded like she knew nothing about MSPI, explaining everything as GERD or something else. I guess I've become somewhat of an MSPI activist, because I e-mailed both the doctor and the editor. I'm hoping more people will do the same, because I think it would make a difference to so many moms who are struggling with this if it received more attention in magazines and if every pediatrician knew about it. Andrea, thank you for the great recipes the last few days. John and Elaine-I just went out and read the article. I was so disgusted I couldn't even read the whole thing. I sent a letter as well. Because of the advice pediatricians give like that,our lives were miserable for a long time. I requested they do a story on MSPI. I feel like an activist as well, I've literally stopped people in public and later found out I was correct. John and Elaine: Thank you for bringing that article to my attention. So frustrating! I'm going to send them a letter, too. It still boggles my mind that so many in the medical establishment are clueless about MSPI! Why is worcestershire non MSPI? I read the ingredients and didn't see any soy or milk protein or equivalent. Jasonmolinari: Worcestershire sauce usually contains soy sauce, which has the soy protein in it. I have yet to come across one that didn't have soy, but if you're able to find one that's MSPI-friendly, lucky you! Hrm.. Lee and Perrins (the main worcestershire sauce) does not list soy sauce as an ingredient...unless i completely missed it! click on teh original sauce ingredients, i don't see soy sauce...am i missing something? You're right, I don't see any soy in that brand of sauce. Fantastic! Thank you for pointing it out to me! there is no recipe listed here, just the description and comments! Click on the words "this recipe."